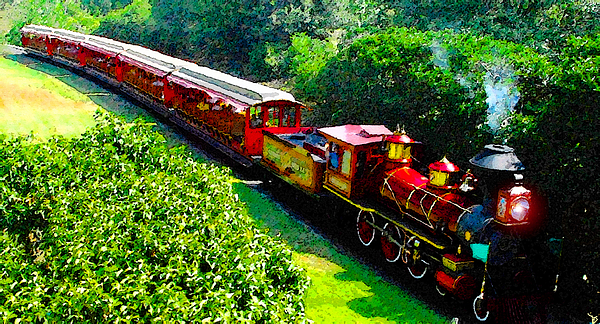 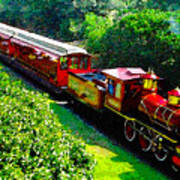 Artwork of the Roy O. Disney steam train at the Majic Kingdom in Walt Disney World Florida. The Roy O. Disney steam train number four invisioned here as it appeared in the early 1970s just after it's naming and the passing of Walt's brother and partner Roy O. Disney. 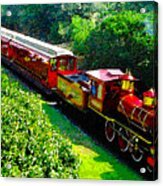 In the early days of the Majic Kingdom there were many stretches of empty and green space (Mostly in the backside of the MK) for the Roy to run as it was in operation before many of the later rides and attractions now present at the Majic Kingdom. Walt and Roy will never be forgotten, signed.